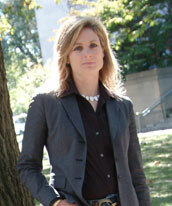 LISA RANDALL is Professor of Physics at Harvard University. She began her physics career at Stuyvesant High School in New York City. She was a finalist, and tied for first place, in the National Westinghouse Science Talent Search. She went on to Harvard where she earned the BS (1983) and PhD (1987) in physics. She was a President's Fellow at the University of California at Berkeley, a postdoctoral fellow at Lawrence Berkeley Laboratory and a junior fellow at Harvard University. She joined the MIT faculty in 1991 as an assistant professor, was promoted to associate professor in 1995 and received tenure in 1997. Between 1998 and 2001 she had a joint appointment at Princeton and MIT as a full professor. She moved to Harvard as a full professor in 2001. Lisa Randall’s research in theoretical high energy physics is primarily related to the question of what is the physics underlying the standard model of particle physics. This has involved studies of strongly interacting theories, supersymmetry, and most recently, extra dimensions of space. In this latter work, she investigates “warped” geometries. The focus of this work has been a particular class of theories based on five-dimensional AdS space which has the remarkable property that the graviton is localized and the space need not be compactified. Related work demonstrates that this theory yields a very natural resolution to the hierarchy problem of particle physics (the large ratio of the Planck and electroweak scales) and furthermore, is compatible with unification of gauge couplings. This latter class of theories suggests interesting experimental tests. The study of further implications of this work has involved string theory, holography, and cosmology. Lisa Randall also continues to work on supersymmetry and other beyond-the-standard-model physics. Within a year of her work on extra dimensions, it was featured on the front page of the Science Times section of The New York Times. It has also been featured in the Economist, the New Scientist, Science, Nature, The Los Angeles Times, The Dallas Daily News, a BBC Horizons television program, BBC radio, and other news sources. She has also been also been interviewed because Science Watch and the ISI Essential Science Indicators have indicated her research as some of the best cited in all of science. She is the author of Warped Passages: Unraveling the Mysteries of the Universe's Hidden Dimensions.